About 250 Arabs attacked Jews at Esh Kodesh. Jews defend themselves with rocks, fire in the air. 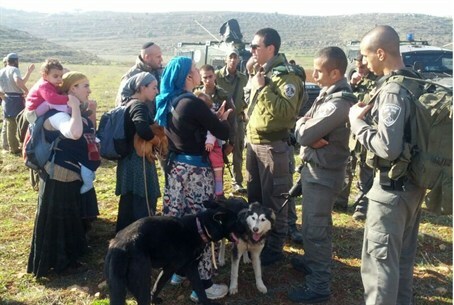 About 250 Arabs rioted Saturday afternoon near Esh Kodesh, close to Shilo in the Binyamin region, injuring 11 Jews. According to the Tatzpit news agency, the rioters tore down the fences surrounding the Jewish residents' vineyards, causing them serious damage. About 30 Jewish residents from the Shilo area rushed to the location and at first had to use rocks to get the Arabs to back off. Israeli security forces instructed the local emergency team to go into action, and the responders fired in the air until the IDF arrived in the scene. According to a report from Esh Kodesh, about 11 Jews were injured in the rioting. One of them suffered a head injury and was taken by MDA to a hospital. The rest of the casualties, including the Military Routine Security Officer ("ravshatz") were slightly hurt and received treatment on the scene. Heavy damage was caused to some of the residents' vineyards, including the uprooting of saplings. Givot Shilo's security vehicle was damaged with a slingshot.